Steps required to connect to UNOH's wireless network. As a courtesy to its faculty, staff and students, the University of Northwestern Ohio provides Wi-Fi access to the public Internet through access points located in certain areas throughout campus. This service is provided as-is. And while the University IT department assumes responsibility for maintaining the wireless infrastructure, no level of service is guaranteed and no support will be provided to end users beyond the basic instructions required to connect to the Wi-Fi system. Users of the wireless network are expected to adhere to the University's Technology Usage Ethics policy at all times. This document outlines the steps required to connect to the University's wireless Internet connection available in several areas across campus. Some versions of Windows 7 require the eduroam installer. Follow the steps below if this doesn't apply to you. UNOH has adopted eduroam, which is used by many educational institutions, as a secure way to offer WiFi to campus visitors. Connect to the SSID labeled "eduroam". When prompted, fill in the identity field with your full UNOH email address. * Make sure you scroll down to enter your UNOH password. Leave the 'Anonymous Identity' field blank and hit 'Connect'. When an institution sets up eduroam, they agree to allow visitors to use their eduroam WiFi network. Once you have setup your WiFi device for eduroam, you have the ability to connect to any eduroam WiFi network on any campus where the service is offered. Those wishing to use eduroam should be configured at UNOH prior to using the network at another institution. Can I use eduroam at participating universities? Yes. See the list of institutions at https://www.eduroam.us/institutions_list. Will the “UNOH WiFi” and “UNOH_802.1x” networks go away? Yes. Although you will still be able to use these legacy networks alongside eduroam, they will be removed from use January 1, 2017. You should begin using eduroam at your earliest opportunity in order to avoid a service disruption when the old networks are removed from service. When traveling, will I have access to UNOH resources? Yes. As with any Wi-Fi network, any UNOH service that you can access while on campus with the eduroam network will be similarly available when connected to an eduroam network at another institution. Faculty and staff who have access to VPN services using UNOH supplied laptops will still need to utilize a VPN connection in order to access certain UNOH services while traveling. Will my visitors have access to eduroam when at UNOH? Only visitors from other participating eduroam institutions will have access to eduroam here at UNOH. Visitor access will be limited to Internet usage only. No other UNOH services will be made available to campus visitors. What devices can be attached to eduroam? 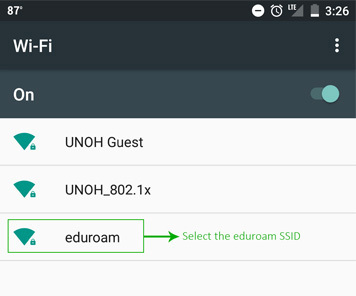 Any devices that allow a secured Wi-Fi connection through the ability to login into the UNOH eduroam network should be able to connect. This includes many laptops, tablets, and smartphones running a variety of operating systems. However, there are known issues when attempting to use older devices that do not use modern Wi-Fi security protocols. These older devices will not connect to eduroam are therefore not supported. Do I have to log into eduroam each time I want to use it? No. The UNOH eduroam network should always be accessible once logged in with a valid UNOH e-mail address and password. As passwords expire, you may be asked by your device to log in again.